'Clunker Junker' brings the danger of space battles into reality. You're never going to play Clunker Junker in your living room or on your desktop PC, no matter how many GPUs it has. 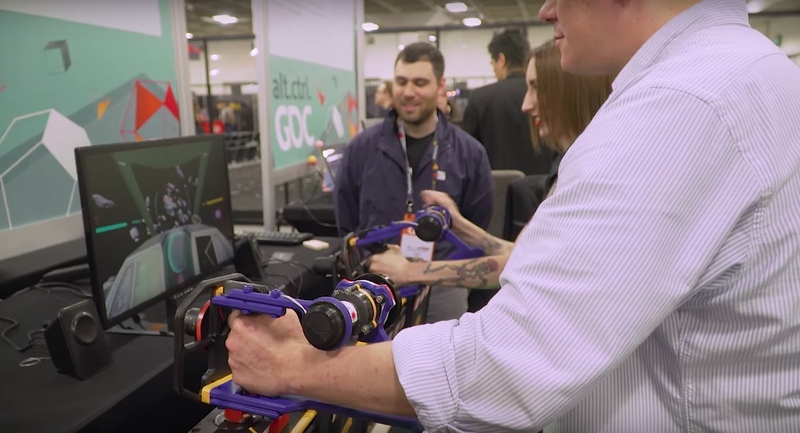 Hardware is the issue here, but it's not a matter of processing power -- Clunker Junker requires two LED-adorned arm cranks, plus four crates with glowing lights and doors that come crashing down when they're unlatched during gameplay. The game itself, to be fair, runs on a laptop, but that's about as traditional as this thing gets. Clunker Junker is a cooperative space shooter for two players. Each crew member has a handheld, gun-like controller that stretches from palm to elbow; it's made to be held in the left hand, with a crank on the right side, a navigation cube on the base and an LED spout on the front. The spout fits into openings in the four crates, representing different aspects of the spaceship -- movement, shields, weapons and engine. Players stick their navigation cubes into squares cut in the top of two of the boxes; one person controls where the ship goes while the other manages the direction of the turrets. When the on-screen ship takes damage (and, trust me, all Clunker Junker players will take damage at some point), flaps on the front of the affected boxes slam down, their innards glowing red and demanding repairs. Fix up the ship by sticking the LED gun into the appropriate hole and turning the crank until the box glows green again. Then close the flap and get back to steering the ship or shooting with the turret -- or fixing whatever else has broken in the interim. Clunker Junker is a fast-paced, communication-driven video game that doubles as a solid arm workout. Its creators at experimental studio HNRY know how to build physical experiences with real impact: Last year, they took home the alt.ctrl.GDC award at the Independent Games Festival for their Fear Sphere project. Not bad for a group of folks making weird games in their spare time, just for fun. That's the heart of the alt.ctrl.GDC space -- strange experiences built to push the boundaries of video game development, rather than turn a profit. Clunker Junker may not be heading to the Xbox One or PlayStation 4 any time soon, but the ideas powering its development may, one day, seep into traditional development pipelines.